Beebe Healthcare offers free flu clinics for the community in 2016. Influenza viruses are always changing so annual vaccination is recommended. Each year scientists try to match the viruses in the vaccine to those most likely to cause flu that year. Vaccinations will be provided to adults only (18 and over) at the clinics. Parents should contact their children's physician or the Division of Public Health for information about pediatric vaccinations. Megan Williams, DNP, BA, FNP-COPC, director of Population Health, said Beebe will once again host a free flu clinic at the Medical Center in Lewes every Monday from 9 a.m. to 1 p.m., September 19 through November 17, 2016. Beebe also participates in free health screenings at events across Sussex County to better serve the community. People 50 to 64 years of age. Nearly one-third of people between the ages of 50 and 64 years of age in the United States have one or more medical conditions that place them at an increased risk for serious flu complications. People who can transmit flu to others at high risk for complications. Any person in close contact with someone in a high-risk group should get vaccinated. This includes all health-care workers, household contacts and out-of-home caregivers of young children up to 23 months of age, and close contacts of people 65 years and older. People 65 years and older. People who live in nursing homes and other long-term care facilities that house those with long-term illnesses. Adults and children six months and older with chronic heart or lung conditions, including asthma. Adults and children six months and older who needed regular medical care or were in a hospital during the previous year because of a metabolic disease (like diabetes), chronic kidney disease, or weakened immune system (including immune system problems caused by medicines or by infection with human immunodeficiency virus [HIV/AIDS]). Children 6 months to 18 years of age who are on long-term aspirin therapy. (Children given aspirin while they have influenza are at risk of Reye's syndrome.). Women who are pregnant during influenza season. All children 6 to 23 months of age. People with any condition that can compromise respiratory function or the handling of respiratory secretions (that is, a condition that makes it hard to breathe or swallow, such as brain injury or disease, spinal cord injuries, seizure disorders, or other nerve or muscle disorders). If you become ill with the influenza virus, make sure to rest, drink plenty of liquids, avoid using alcohol and tobacco, and take medication to relieve symptoms. Never give aspirin to children or teenagers who have flu-like symptoms, especially fever, without consulting a physician. In some cases, physicians may choose to prescribe certain antiviral drugs to treat influenza. Antibiotics do not cure influenza, which is caused by a virus. Every Monday, from 9 a.m. to 1 p.m., September 19 through November 17, free flu vaccinations will be given in the lobby of the Medical Center on Savannah Road in Lewes. October 14, 8 a.m. — 10 a.m., at Rehoboth Police Department, Rehoboth Beach Fire Department, East Bay, 219 Rehoboth Ave.
October 18, Noon — 3 p.m., at Beebe Lab Express, Milton, Clipper Square Shopping Center, 614 Mulberry St.
For more information on the clinics, call Beebe Population Health at (302) 645-3337. 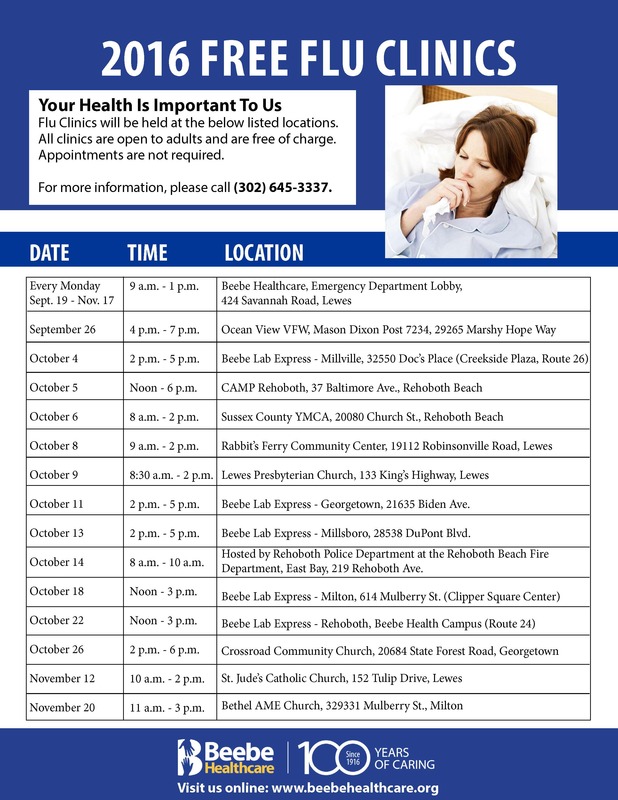 For a full listing of flu clinics and street addresses, go to www.beebehealthcare.org/calendar.